NYC, 02/11/2019, 2:00PM. 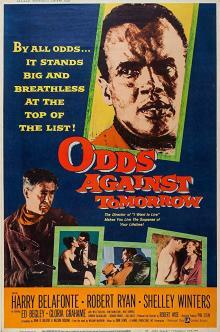 Odds Against Tomorrow (1959): Debt-burdened Men Uniting For A Bank Robbery. 96 min. Director: Robert Wise. Starring Harry Belafonte, Robert Ryan, Gloria Grahame. Odds Against Tomorrow is based on a novel of the same name by William P. McGivern. The film was nominated for a Golden Globe Award for Motion Picture Promoting International Understanding.